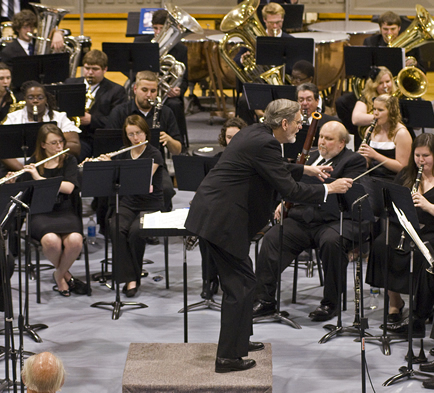 The Newberry College Department of Music is perfect for aspiring music performers, music teachers, and church musicians. 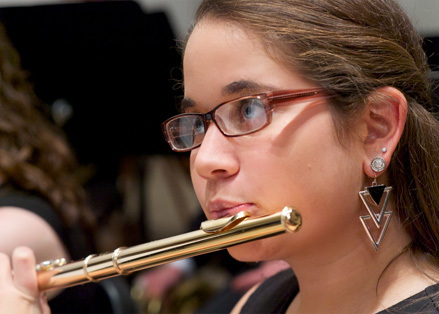 Nationally accredited though the National Association of Schools of Music (NASM), the department prepares students for future careers in all areas of music. With a low student-to-faculty ratio and an outstanding faculty of active performers who are also experienced teachers, we ensure that every student receives the personalized, attentive instruction essential to developing one's musical talent to the fullest. Newberry College’s nationally accredited (NASM) Department of Music is perfect for aspiring music performers, music teachers, church musicians, and more. We strive to prepare students for future careers in all areas of music. With a low student-to-faculty ratio, and an outstanding faculty of active performers who are also experienced teachers, every student receives the kind of personalized, attentive instruction that is essential to developing one's musical talent to the fullest. The Music curriculum is designed to prepare students for careers in all areas of music. It provides a comprehensive musical foundation from which students may pursue an ongoing involvement with music. Newberry Music graduates are prepared to participate and lead in multiple facets in the field of music. Our graduates include professional performers, music industry business professionals and choral and instrumental music educators who are leading outstanding school music programs throughout the region. Newberry Music alumni also have earned graduate degrees in programs throughout the United States. The Music (General) major is for the student who enjoys performing and wants to develop that ability in preparation for musical opportunities such as teaching in a private studio or freelance performance. Students may also select a variety of electives to explore other academic areas. The Music major with Church Music emphasis provides the skills and knowledge for the student who has a special interest in music ministry and music performance in a church setting. Students explore the multifacted denominations of Christianity as they develop their knowledge and understanding of music in a congregational setting. Students may continue with graduate study in a related area or secure employment as a church musician. The Music major with Music Theory emphasis is intended for the student who wants to develop expertise in music theory, analysis and composition. The degree helps prepare the student for continued music studies in theory or for related creative endeavors. Combined with the support you receive from Music department faculty and staff, this handbook will provide you with information about department policies and procedures, important forms, advising, information about juries and recitals and much more. View the Student Handbook. Applied lessons must be taken until the successful completion of MUS 380. Applied Secondary Instrument – Piano (MUA 101-2 credits; MUA 102-2 credits. Keyboard majors exempt MUA 101 and MUA 102. Applied Secondary Instrument – Piano (MUA 101 – 2 hrs. ; MUA 102 – 2 hrs., and 4 hrs. of piano lessons). Keyboard majors exempt MUA 101 and MUA 102, and are required to complete 12 hours total of lessons in their major keyboard instrument. The Music minor is designed for students who are interested in music but are majoring in another discipline. The Jazz Studies minor is designed to be taken by students currently enrolled as music majors. Non-majors may also enroll in this minor with the permission of the Department of Music. Some of the courses required for the Jazz Studies minor may have prerequisites that will require additional course work for non-majors. The Musical Theatre minor is designed for students who are interested in Musical Theatre and are majoring in B.A. (Music) or B.A. (Theatre) or in another discipline. The Bachelor of Music in Performance degree enables the student who is interested in a performance career, private teaching, and/or graduate study to acquire the skill and knowledge associated with high-level instrumental or vocal performance. Special emphasis is given to development of aesthetic performance and understanding. Any student wishing to pursue this degree will initially begin studies in the Bachelor of Arts in Music degree. The Sophomore Barrier exam will determine admittance into the Bachelor of Music in Performance degree. The Bachelor of Music in Performance degree enables the student who is interested in a performance career, private teaching, and/or graduate study to acquire the skill and knowledge associated with high-level vocal or instrumental performance. Special emphasis is given to development of aesthetic performance and understanding. Any student wishing to pursue this degree will initially begin studies in the Bachelor of Arts in Music degree. The Sophomore Barrier exam will determine admittance into the Bachelor of Music in Performance degree. Piano (MUA 101 – 2 hrs. ; MUA 102 – 2 hrs. ; MUA 121 – 1 hr. ; MUA 122 – 1 hr.). Keyboard majors exempt MUA 101 and MUA 102 and must take their secondary credits in another area. Chamber Music (MUE 105, 106, 107, 108, 109, 110, 112) Required of instrumental majors each fall. If MUE 105 is taken in the fall, it must be accompanied with another option. Students become well-rounded life-long learners, musicians, and teachers of music through courses in areas of general studies, musicianship, and professional and music education. Candidates choose a concentration of vocal or instrumental music, but upon graduation are prepared and qualified to teach any music subject and level. Successful graduates will possess the knowledge, skills, and dispositions to provide confident, enthusiastic, and committed leadership in the field of teaching music. 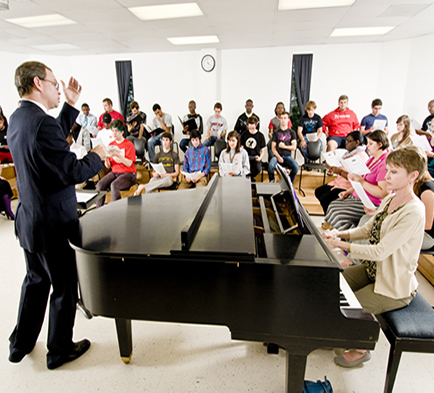 The Bachelor of Music Education degree, in cooperation with the Newberry College Department of Teacher Education and Sport Professions, leads to South Carolina PK-12 licensure and is designed for those students aspiring to the challenging and essential service of teaching music in the public school sector. Students become well-rounded life-long learners, musicians, and teachers of music through a rigorous curriculum including courses in areas of general studies, musicianship, and professional and music education. The Church Music minor may be taken by music majors or by students in other majors who have an interest in music and worship. Students with a keyboard concentration may substitute MUS 173 at the discretion of the instructor. Note: MUS 343 is recommended for non-music majors completing this minor. The Music Business minor is designed for students who are interested in Music Business and are either majoring in the B.A. (Music) or in another discipline. Recognize the outstanding student musicicans following a music degree other than the Bachelor of Music in Performance, but who perform at the level of the BM in performance and wish to complete additional performance requirements. Prepare music majors who are not pursuing a Bachelor of Music in Performance to audition for graduate degree programs in Music Performance, if they wish to do so. Will include additional performance requirements, but no additional academic coursework. When combined with a Bachelor of Art's degree or a Bachelor of Music Education degree, the increase amount of credit hours is minimal. Posting of "Music Performance Honors" on student's transcript. Students are admitted to this program following the Sophomore Barrier Exam. Students must earn an average of 80 points on the Sophomore Barrier Performance Evaluation Rubric in order to begin the program. Students must meet the same performance standards as Bachelor of Music in Performance student.